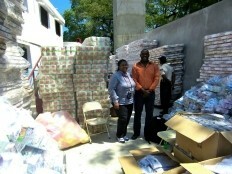 After the distribution of materials [prison of Petion-ville, the National Penitentiary and to the prisons of St. Marc and Gonaives], the inmates of the prison of Cap-Haitien have received Tuesday, several lots of material to meet the pressing and urgent needs to which they are faced and improve their living conditions. In total 1000 hygiene kits [soap, toothpaste, detergent, deodorant and toilet paper], 750 mattresses and sheets, 1.000 bowls, cups and spoons, 810 pairs of sandals810 jerseys and shorts, were distributed to the prison of Cap-Haitien, who has a total of 810 prisoners [784 men and 26 women]. This distribution, supported by the Treasury, following a request by the Directorate of Prison Administration (DAP), to the Office of the Minister Delegate in Charge of Human Rights and the Fight against Poverty Extreme, took place in the presence of Zéphirin Ardouin, Departmental Delegate, of Lesly Jules, Government Commissioner and the Divisional Inspector Romage Marlon, Director of the prison. Various members of prison staff, also participated in this distribution alongside Rose Anne Auguste, the Minister Delegate in Charge of Human Rights and the Fight against Poverty Extreme. With all due respect, most of the prisoners should simply be released! Many have spent months, years for suspicion of a crime that might have received a 1 month sentence – if guilty. The prisons should be filled with Senators and Deputies.